I love drinking fresh pressed apple cider in the fall. As a kid we’d buy it at a seasonal market in my home town called the The Cider Mill. They pressed the apples in house, bottled it on site, and sold it by the gallon. They sold cider, doughnuts, and candy apples. That was it. In the midst of an otherwise whirlwind of a ‘wedding season’, Marie and I found ourselves with a day off and were itching for something autumnal. We've been wanting to go apple picking since moving to LA — not because we grow a whole lot of apples here in the City of Angels, but because there is an incredible, not-so-little, apple growing region about 90 miles east of LA; tucked into the foothills of the San Bernardino National Forest. 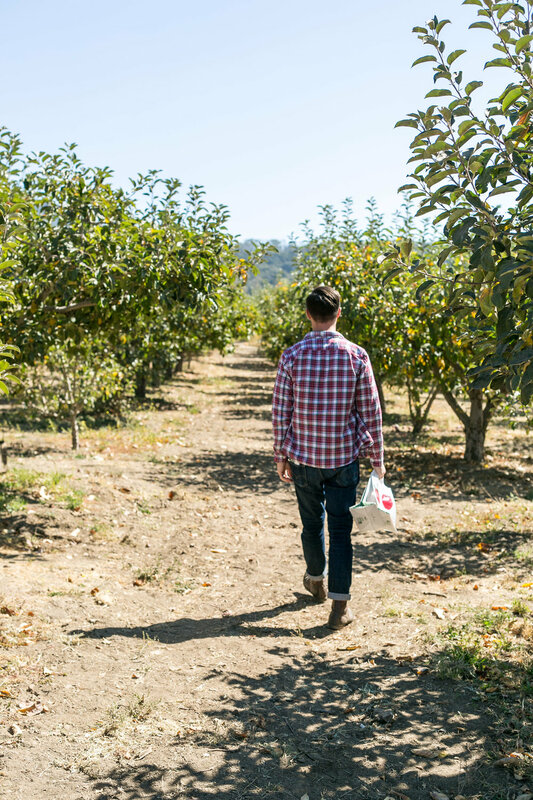 There are an overwhelming number of orchards to pick from — each with its own alluring qualities. We ended up at Riley’s at Los Rios Rancho, a family friendly farm with all the people and all the activities. We filled our day sharing apple hand pies, listening to bluegrass, eating BBQ and grilled corn, and braving the ‘U-Pick’ orchard. Marie was a total trooper -- being 8 months pregnant and all. Pro Tip: get there as early as possible or go on a week day if you can swing it. We left with a gallon of fresh pressed cider and a 10 pound bag of hand picked apples. It was my kind of day. Now for the cocktail! Bourbon and cider go together like — well, I like bourbon with anything, but this happens to be one of my favorite combos : ) For this recipe we combined fresh lime, house made ginger syrup, and soda water to create ‘fresh ginger beer’ which acts at the base of our Buck. We spike it with bourbon, add a dash or two of bitters, and lengthen it with some fresh pressed cider. Combine ingredients (except *soda water) in a shaking tin. Add ice, shake, strain into a collins glass, and top with soda. Garnish with an apple fan and enjoy!